This piece is the first of a two-part series. Journalism is in a panic over facts. Fake facts. Alternate facts. Ideological facts. We need journalistic sherpas helping citizens navigate through a miasma of shock talk, trolls, and partisan diatribe. Suddenly, after decades of polls showing a decline in public trust in media, millions of dollars are being spent by Facebook, Google, media foundations, schools of journalism, and governments to teach media literacy, develop digital journalism, and engage audiences. Mainstream journalists, such as CNN’s Brian Stelter, call on journalists to remain “neutral” and return to basic principles. Fact-checking is a virtual industry. Ironically, a good number of journalists, after decades of skepticism about objectivity, want to revive a journalism of facts, an ethic constructed in the early 1900s. Others call for a partisan, anti-Trump media. Truly, these are confused times. There is no going back to journalists as neutral stenographers of facts. And partisanship will not help. In this article, I seek to undermine one of these options, the idea of a journalism of fact. I argue that it is both an incorrect description of practice and a misleading ideal. In its place I promote a journalism beyond facts. I am not exactly sure what journalists and citizens mean when they say that journalists should report the facts neutrally, rather than give us their opinion. Do they mean report only facts? Does this mean that journalists should strip down their stories to bare facts in a vain effort to eliminate all traces of interpretation, perspective, and evaluation? If so, this is the old professional model of objective reporting constructed in the early 1900s for an entirely different news media. Its dualistic presumptions—that we can draw hard lines between facts and opinion, neutral description and value judgments—are impossible to defend, while digital journalism only grows more interpretive and perspectival. Even if people do not mean this old model, they still owe me a definition of fact. The idea of fact is deceptively clear. By focusing on matters of observation and measurement, we think facts are obvious: I weigh 180 pounds, the president said x or y, metal expands when heated, the moon is 384,400 kilometers from the earth. Yet, what are we to say about alleged facts more abstract and remote from the senses? Are the abstract laws of physics facts, or theory? Is Darwinian natural selection—a long and largely unobserved process—a fact? Some things we call fact, like climate change, are complex sets of beliefs based on mathematics, theory, and computer modeling. If you still think fact equals “observable,” do we actually observe the intensity of an electric current, or simply have a means to measure it? The advocate of journalism of fact finds herself in a pickle. She can say that she means all and any fact. A fact is a fact, whatever its type. But this waters down her doctrine to a truism. In effect, a fact becomes any belief that is true. But the point of “journalism of fact” is to argue that journalists should limit their reporting to a distinct type of truth or fact—empirical facts of observation and witnessing. Now, the doctrine simply says: report the truth, which is already an established principle of journalism ethics. Or, the journalist of fact may hold fast to the idea that journalists can report on empirical facts in a distinctive way: facts scrubbed clean of interpretation, theorizing and values. But in journalism, and elsewhere, this scrubbing is, at best, only partially successful. We cannot completely pry apart facts, values, goals, and theorizing. Our mind cognizes the world “widely” through interpretations where observations, evaluations, methods, and goals fuse together. Even straight reporting is not entirely straight. It interprets what events are newsworthy; it decides on the event’s news angle; it judges the credible sources to be quoted; and it evaluates the significance of the event. Judgments of newsworthiness, credibility, and significance are hardly “neutral” matters of fact. They depend on the journalists’ values, goals, and beliefs, and the culture in which they work. Those who repeat the mantra “report the facts” forget that most facts are misleading unless we correctly interpret them. The government’s alleged “facts” on the employment rate, or the police chief’s alleged “facts” about how well he is fighting crime, cannot be taken at face value. Opinion polls are worthless unless reporters skillfully interpret the numbers. The problem becomes more difficult when we leave the realm of numbers, e.g., when journalists report someone’s contentious fact about history. Not only is “journalism of facts” the wrong description of journalism, it is the wrong ideal for journalism. “Impartiality in service of democratic engagement” is the correct goal. Journalists should be impartial in method, but engaged with their society, fulfilling their roles and purposes. Impartiality of method means not only that journalists use accurate methods for verifying stories, it also means they should approach topics and evidence with an open and unprejudiced mind, willing to following where inquiry leads. They adopt impartiality because it serves an important purpose—to accurately and fairly inform the public. Impartiality or neutrality are not self-sufficient stances. They make sense relative to a larger set of purposes, a non-neutral engagement with the world. Furthermore, following where inquiry leads means stating the conclusions at which one arrives. Impartial journalists are free to express an informed judgment or evaluation just as an impartial judge passes judgment. Neutrality is an entrenched misunderstanding of modern journalism ethics. Historically, journalists have never been able to practice strict neutrality with any consistency. Also, among the best examples of journalism are non-neutral investigations. Were the editors of the Washington Post neutral when they opposed Nixon as he tried to prevent the publication of the Pentagon Papers? When journalism societies give out awards for excellence, the judges stress how the journalists gave voice to the voiceless, or stopped injustice, or enhanced democracy. Neutrality is not stressed. A studied neutrality is a luxury we cannot afford today when powerful groups practice journalism, often through manipulative means. What Does the Public Need? Journalism of fact is incomplete as an ideal for democratic journalism. The public needs many types of information and communication, beyond straight factual reporting. Consider the types of information in the diagram. 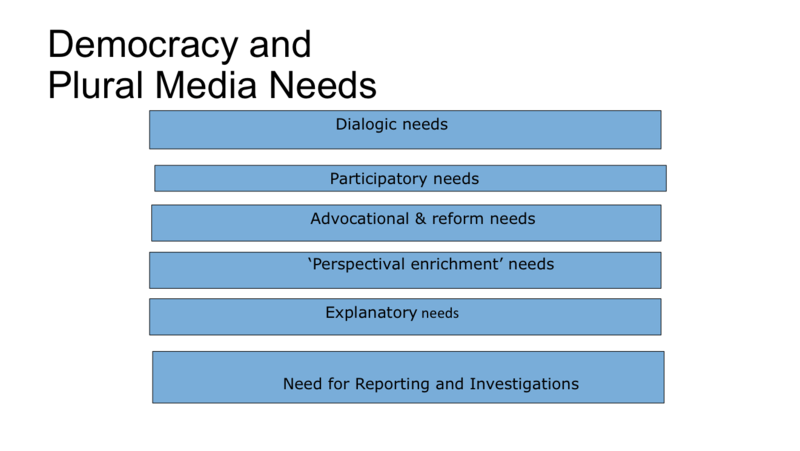 I identify six kinds of “media needs” in a democracy: (1) factual reporting and in-depth investigations; (2) explanatory journalism, such as we find in science journalism; (3) exposure to a wide variety of informed perspectives to enhance perspectives; (4) reform and advocacy journalism; (5) a media system where citizens can participate in doing journalism and in media discussions; and (6) dialogic forms of media discussion, not ranting. Traditionally, the professional model of neutral journalism has privileged one of those needs—the bottom square, representing factual, information needs. But once you admit the other five needs, you introduce ways of doing journalism that go beyond fact-stating. You place value on a journalism that involves explicit interpretation, the reasoned sharing of views, historical and causal explanations, knowledge of the values of one’s society and their links to global issues. 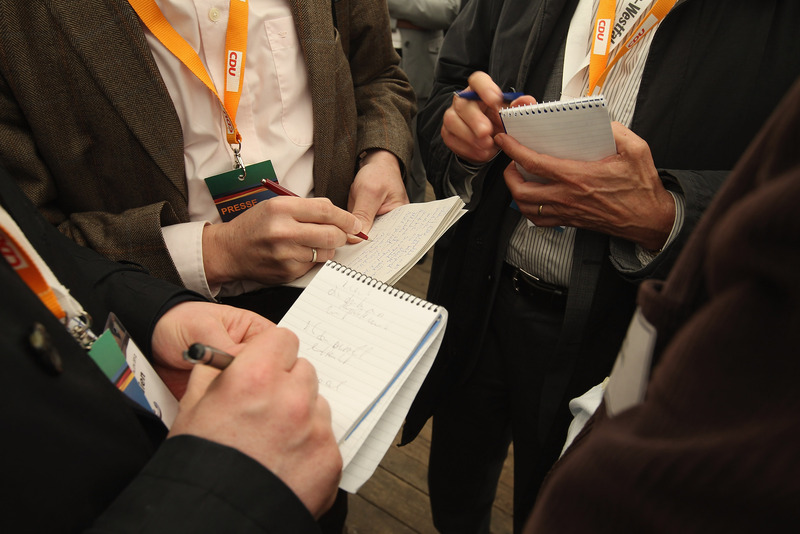 Together, these six forms of journalism constitute journalism beyond the facts. But Aren’t False Facts the Problem? False facts are an issue, but hardly the only one. Journalists should not report false facts. They should expose the purveyors of false news for what they are: manipulators who poison the wells of reasoned discourse. Therefore, the fact-checking movement is a positive response. But, by itself, fact-checking is inadequate. Because the problem of our corrupted public sphere is not just the problem of people coming to believe a false fact. It is about people adopting false interpretations, inaccurate beliefs, and simplistic solutions to issues. Our democracy struggles against a wave of hate mongers with malicious, xenophobic representations of anything “foreign” stirred up by populist leaders and intolerant groups. We need to know more than that a politician made a false statement, or a “pants-on-fire” lie. We need to reject neutrality and challenge misinterpretations of our basic political principles. A return to a journalism of fact is an inadequate response to a public sphere where what is a fact is too often someone’s alleged fact, asserted for private or ideological gain. In this climate, if any politician unjustly threatens a minority, or threatens to “pull the license” of NBC news or some other news outlet, I hope journalists will not be neutral but will oppose such action. 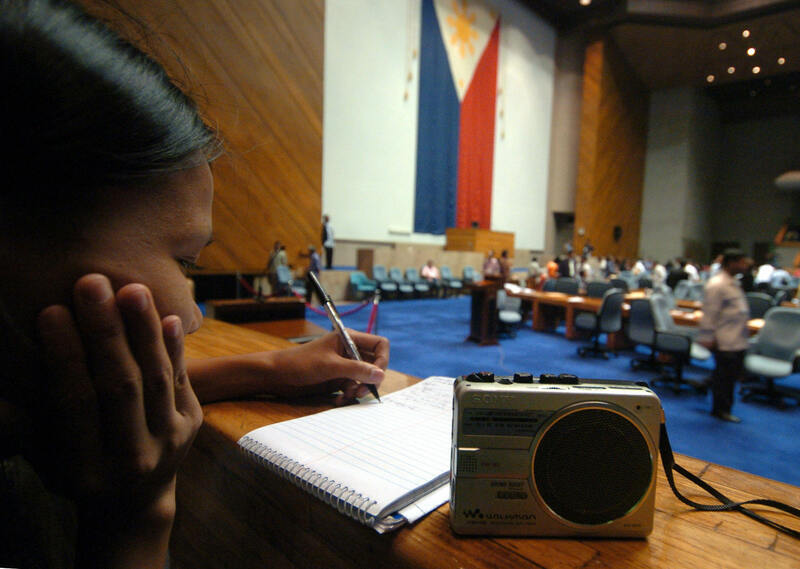 Journalists need to prepare citizens for confrontations ahead where they will be called upon to make judgments based on a deep sense of their values and on a civic knowledge that goes beyond bare facts. In summary, we need a journalism beyond facts. Not journalism without facts. Rather, we need journalists with the cultural knowledge and critical skills to create, identify, and critique credible interpretations. We need journalistic sherpas helping citizens navigate through a miasma of shock talk, trolls, and partisan diatribe. Journalists beyond facts would display a healthy respect and appetite for empirical fact and our best empirical theories. But they would not seek to be neutral or to reduce their narratives to facts scrubbed clean. Journalism beyond facts will need a revolution in journalism education that goes beyond using new technology to knowledge of the world. We need a new generation of journalists who can mount a resistance to the “mind warfare” of ideological fanatics. We need to educate journalists who can place isolated facts into meaningful context. We need journalists who are at home in the world of policy, culture, and global affairs—cosmopolitan journalists of broad mind. In the next article, I will explain what journalism beyond facts means when we include digital citizens as part of large-scale social resistance to the corruption of the democratic public sphere.